The triangle (left) combines a leg stretch with a rotation. It is easily accessible for beginnners and is stimulating for non-beginners. It is probably my overall favourite. 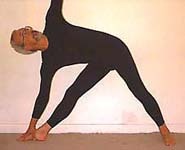 Anantasana (next) is a good basic leg stretch. You dont have to overstrain to do it, as long as you can reach your leg with your arm (and you can always use a loop). Splits combine a strong leg stretch with a good feeling of stability and balance. As well as working on the hamstrings, splits work on the hips. The splits can be done with a number of variations, including a forward fold, a twist, and a backbend. Doing oversplits mean that standard flat splits become part of your normal range. The wheel gives an incredible feeling of opening out in the torso. 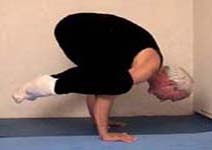 It is my favourite backbend, because it gives you complete control over where in the back the stretch is concentrated. If you push with the feet, you get an exhilarating feeling of the chest opening wide. It also looks (just a little bit) weird. Next: head resting on soles of feet and diamond. Then pigeon, scorpion, pigeon in a split (ring split), scorpion again, and crow. Finally: side splits - I thought I'd never be able to do these! Experiments in ways to enhance the stretch: (1) Pressing the chest up against a wall, and pushing with the legs (though this tends to compress the lower back). (2) Using a low table and walking the legs in - this gives a wonderful tight curve in the upper back and shoulders. (3) Lying back over a support - there is no strain on the back because it is fully supported (at its tightest bend). 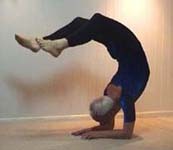 The spine is lengthened in this position by holding on with the hands and using ankle weights. 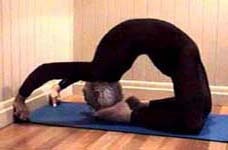 Lengthening the spine is the secret to backbending. Watch Scorpion and a crabwalk across my back garden on Youtube (keep the volume up on the latter to hear Australian bird calls in the background).